Snohomish County Council with Naval Station Everett leadership. Photo courtesy of Snohomish County. By Cassie Fannin – Snohomish County Council Public Information Officer. 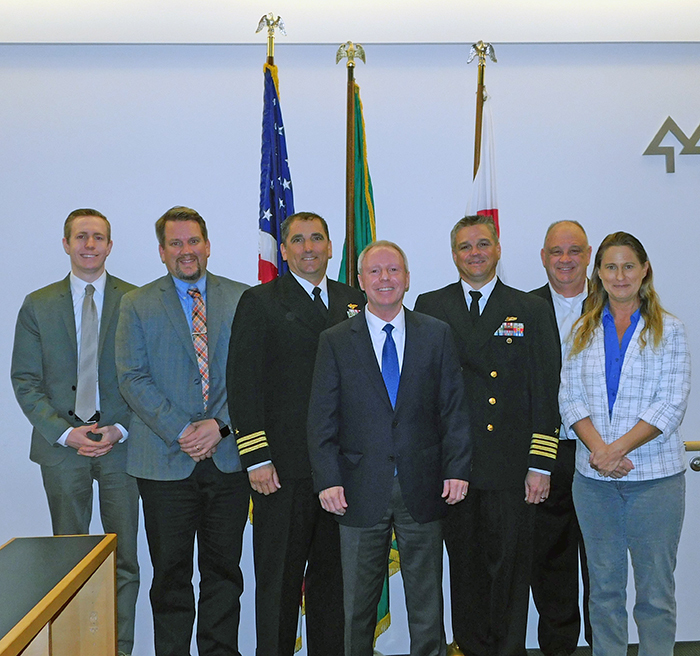 On Wednesday, April 10, 2019, the Snohomish County Council passed resolution 19-012, recognizing Naval Station Everett’s 25th Anniversary. The Council would like to honor the military and civilian personnel that work at the station and express how much we also value the families that support them and their work. For these past 25 years Naval Station Everett has been woven into the fabric of our community. The Council recognizes the significant positive impacts Naval Station Everett has provided to our public. Naval Station Everett was selected from among 13 ports as an ideal location for the Navy’s Strategic Homeport Initiative, with Initial Operating Capability achieved in April 1987. It is a critical facility to the Navy, being one of only two deep water port facilities on the western coast of the United States and the most modern shore installation in the U.S.
“The Navy is such an integral part of our community here in Snohomish County – I look forward to the next 25 years of engagement and partnership with the Navy,” said Councilmember Brian Sullivan. In 2017 Naval Station Everett received awards for its conservation achievements including 2017 Secretary of the Navy Environmental Award for Industrial Sustainability and the 2017 Secretary of the Navy Energy Conservation Award. The Council would like to thank Commanding Officer Captain Michael Davis and Commander R. D. Burley for attending our General Legislative Session for our passage of this resolution. We are extremely proud that Naval Station Everett calls Snohomish County home.